Happy Days Entertainment | Kids Party Packages that cater for all ages. All our staff are DBS checked. Get Your Free Party Quote Today! 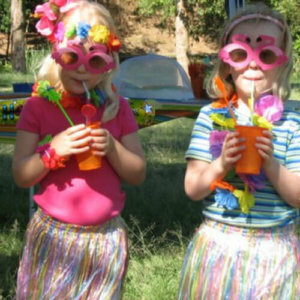 At Happy Days Entertainment our children’s entertainment & party packages are a great way to entertain your child and their guests. Our shows can be adapted with themed inflatables and characters to suit your requirements. If you are not sure what you need or you have a specific idea then just give us a call on 07789160971 and have a chat with one of the team. We have a number of set packages that you can choose from. All of our shows are a minimum of 2 hours. Book your party on a Monday to Friday and receive a great discount. You can save money by having your party after school. Happy Days Entertainment likes to keep all of its pricing nice and simple. 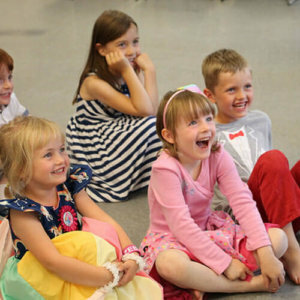 A standard children entertainers party is 2 hours long, however, we do cater for 3 hour parties and even longer. All party packages are interchangable so you can have exactly what you want. If you have any questions or are unsure about pricing please call us on 07789160971. All childrens parties come with entertainment including disco, balloon modelling and party games. You can then choose the extras that you want to go with it. 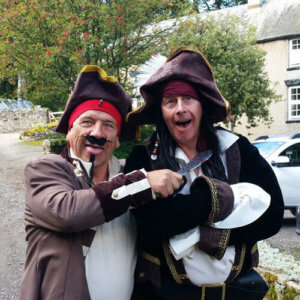 For example, you can choose a 2 hour Pirate Party with Marco the Pirate, disco, balloon modelling, party games plus either a bouncy castle or a magic show for £160. If you wanted the bouncy castle to have an additional slide it would cost £170. A 3 hour Pirate Party with Marco the Pirate, disco, balloon modelling, party games, giant pirate ship, popcorn or candy floss machine would be £300. Happy Days Entertainment has over 30 years of experience in entertaining children and adults of all ages. We have had thousands of parties and want you to have the best time possible with the least amount of stress. Just call us on 07789160971 and we will explain everything to you and let you know what else we have available. What we do know is that your children or guest will have the best time ever. 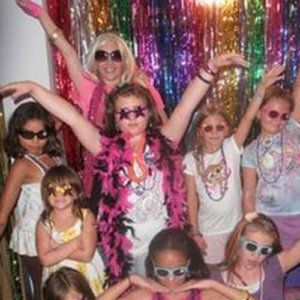 We offer a number of ways to pay for you childrens entertainment party packages. Parties need to be paid 7 days in advance by bank transfer or you can pay us direct in cash on the day of the party. If you would like to pay in instalments or need any more information about payment please call us on 07789160971. Childrens Parties must be cancelled prior to 7 days before an event. If for whatever reason you need to cancel your party booking with us there is no charge as long as you give us a minimum of 7 days notice. If the cancellation is made within 7 days of the event you will have to pay 50% of the cost of the party. Happy Days Entertainment is here and willing to help you no matter what happens so please call us if there is a problem. 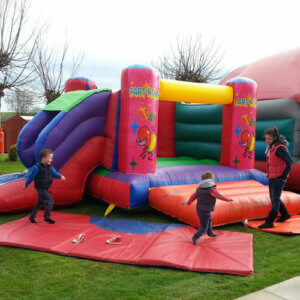 2 hour childrens party – Inflatable Castle plus disco, dances, balloon modelling, party games & fun. 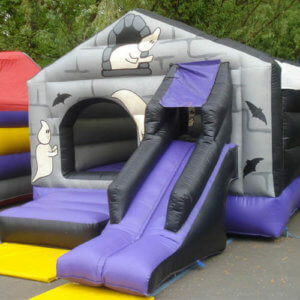 Castle Slide plus disco, party games, dances & balloon modelling for a great 2 hour kids party. 3 hour Pirate Party with Marco the Pirate, Inflatable Pirate Ship (34 ft), disco, party games, balloon models & candy floss or popcorn machine. 2 hour Karaoke party with disco, dances, party games & balloon modelling. Pirate Party with Themed Pirate Castle for 2 hours, Marco the Pirate plus disco, party games, dances and balloon modelling. 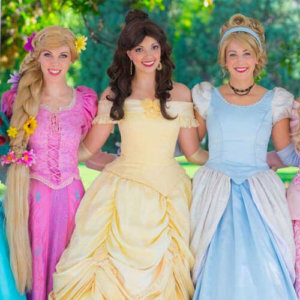 2 hour Princess Party with themed Princess Castle plus disco, party games, dances, singing and balloon modelling. Space Hopper Racing on our special Space Hopper Track plus disco, party games & dances, balloon modelling & a ton of fun for a full 2 hours. 2 hours of Summer Time Beach Themed Party with Volley Ball & Beach Ball Games plus party games, disco, dancing and balloon modelling. Dress code of Shorts & T-shirts! 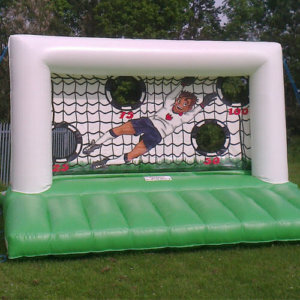 2 hour Football Party with Inflatable Penalty Shoot out plus disco party games & dances, magic show with balloon modelling. Magic Show & Balloon Modelling. 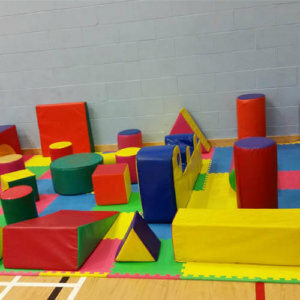 The perfect 2 hour party for younger kids. Soft Play & Ball Pool Party. Soft Play & Bouncy Castle for a full 2 hours. 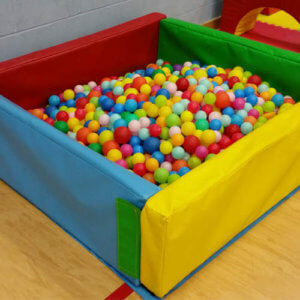 Ball Pool, Soft Play & Bouncy Castle. 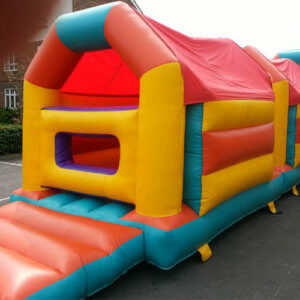 2 hour party with everything perfect for the younger children including; Soft Play Equipment, Ball Pool & a Bouncy Castle. 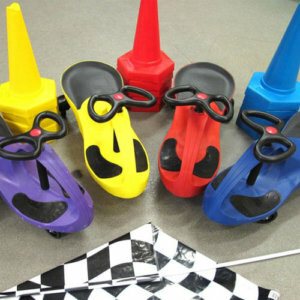 Add an extra element to your party with our Didi Cars & Race Track that is suitable for all ages. Haven’t seen what you are looking for above? 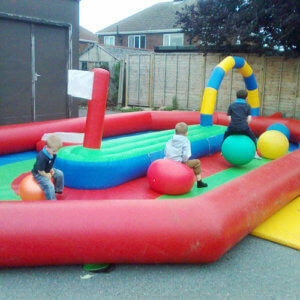 We have loads more inflatables and games are available for hire. 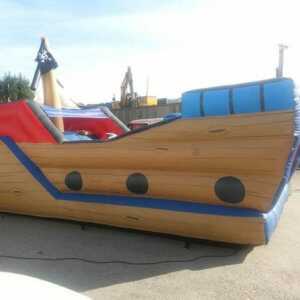 We have Castle Slides, Double Bungee Runs, Gladiator Joust, Climbing Walls, Soft Play, Ball Pools, Giant Jenga & Garden Games, Giant Slides, Inflatable Assault Courses, Huge Pirate Ship. Call Happy Days Entertainment Today! Contact Happy Days Entertainment Today on 07789160971 and let our team of party & event experts create the perfect day for you. Get Your Free Party Quote! Happy Days Entertainment has 5 Million Pounds Public Liability Insurance. Call the team at Happy Days Entertainment to today on 07789 160971 or email us at info@tomtaylorents.co.uk. Fill in our Free Online Quote Form. Check out the pages below for more information on our Party Hire Equipment! Copyright 2017: Happy Days Entertainments.